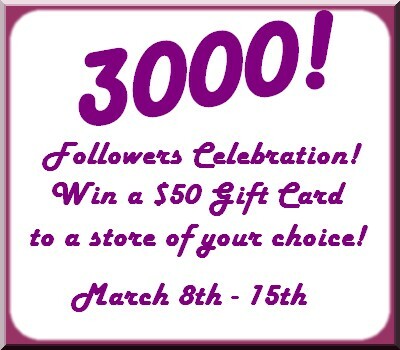 Good Choice Reading: 3000 Follower Celebration! We've reached 3000 followers! *Squee* We still can't believe it! We're so amazed with the love that we've received over the past two years. And as a celebration we all got together and are offering a $50 Gift Card to a store of your choice! Yup, you read it right. $50 GC to ANY store! All you have to do is follow the Rafflecopter below to enter. One thing on the Rafflecopter needs to be done and EVERYTHING else is OPTIONAL. Please read our Contest Rules HERE. * OPEN INTERNATIONAL - As long as we can purchase an eCard for those out of the United States. * Winner will be chosen at Random. * Winner will be announced on our Facebook & Twitter page. * Giveaway ends March 15th. YAY!!! Thank you to all of our followers - this has been one crazy, amazing, and wonderful adventure!!! Thank you, Ingela! Still so hard to believe people actually like our blog hahaha. Wow!! You are rocking the blog world. Congratulations on reaching 3000 followers. Yay!! Love your blogs. Have found some new to me authors based on your reviews and interviews. Congrats on hitting the big 3000. I love blog. Congratulations on 3000 :)! Woohoo! Congrats on the followers! And thanks for the amazing giveaway! Congrats on so many followers, that is awesome! Congratulations on 3000 followers! I always look forward to your reviews. Congrats on reaching 3000 followers!! The giveaway is AWESOME! Keep up the great job! Congratulations! Thanks for the giveaway! That's a great idea to celebrate in such a way. Thanks a lot! Congrats on the big 3000! I did read some book reviews but decided to come back here for my comment. I have too many books on my tablet and not enough real books. Thanks for the giveaway! What twist does the author throw us in "Here?" Just that comment alone perks up my interest and makes me want to take a look at the book! Congratulations on the accomplishment!! And thank you for celebrating with us with such an amazing giveaway! Congratulations! I haven't seen any other blogs with 3000+ followers. Thanks so much for the great giveaway! 3000 that is amazing. I hope when my blog grows up I am as cool as you..
Congrats on reaching 3000 followers. Keep those reviews coming guys. Oh $50 would get me so many books! Thanks for the giveaway. Congratulations! You deserve all the love! Wow! 3K people are reading your posts and enjoying them. That's awesome. Congratulations! How cool to have so many followers. Thanks so much for the giveaway! Ooo! Coolio giveaway! XD Congrats on 3000 Followers! Congrats on the 3000 followers....great accomplishment!!! Congrats on the 3000 followers!!! Awesome!!! Congrats and thanks for the giveaway! So wonderful to hear you surpassed such a great follower milestone of 3K on your blog. You ROCK!! |m| |m| Double Fist Bumps to you! Thank you for the wonderful giveaway/follower appreciation! If I won, I'd probably pick a giftcard for more books. Is that a bad thing? Ooops, I clicked on the enter button for "leave a comment" by accident, Sorry. Congrats on 3000! Congrats on the great news and all the followers. WootWoot!! Thank you for offering such a generous prize. Congrats on your milestone! Keep on blogging! :D Thank you SO much for the giveaway! And thank you very much for this giveaway opportunity! Wowzers!! What a awesome accomplishment! Woo hoo!! Congratulations on reaching 3000 and counting! Congratulations and here's to another 3000 more, woot! Congrats!!! I enjoy following this blog all the new books I find and the reviews help me make the decision on whether I should buy it or not. Keep up the good reviewing! HUGE congrats! What a milestone to reach. Very awesome!!! Congratulations on having 3,000 followers! That's awesome! Congratulations on having 3,000 followers! Whoaaaa. :D Congrats! Thanks for the giveaway! Congrats on reaching 3000 followers. Not a surprise there because your blog is amazing. Thank you for celebrating this with us and for making the giveaway international! That is a wonderful accomplishment! Congrats on all the followers! Glad I found you guys. Thanks for the awesome giveway! I have learned about a lot of books through your site and twitter feed. Thanks so much!!!! Thank you for such a awesome giveaway. Congrats on having over 3000 followers!!! Congrats...wishing you many, many more! Congrats on your 3000 followers! Congrats on 3000 followers!!! So crazy awesome! Congrats! Thanks for such an amazing giveaway. Congratulations! :D And thank you for this giveaway.